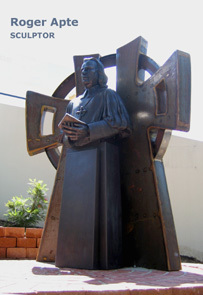 'Portrait of Bishop Daniel Delany' is a commission for a Sydney College. I created the original work in clay over a steel armature then moulded the work and cast it in silicone bronze. Weighing 120kg and requiring a structural steel base for support, the sculpture was craned into place and secured to its base and copper plinth in a matter of minutes. Reference material was a portrait which is believed to have been painted in the 19th century. This together with reading of information of his work provided me with the background feel for the character of this man. 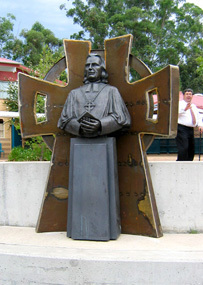 The 'Cross' is a separate sculpture that was then commissioned to complete the whole work. 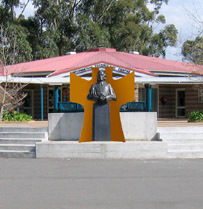 The 'Cross' draws the eye, anchoring the portrait bust visually amongst the many forms and textures of the quadrangle. 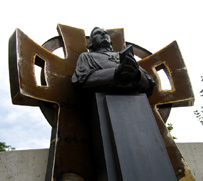 The curved form of the 'Cross' reaches protectively around the portrait and also speaks of the dynamic work of the Holy Spirit through the work of Bishop Delany. The third image shows a digital montage that I composed to communicate the initial concept with my clients. From the ensuing discussion the final design was refined. The result can be seen in the following image. I used weathering steel to create the 'Cross' for its counterpoint in patina to the bronze and its durability in the College environment. 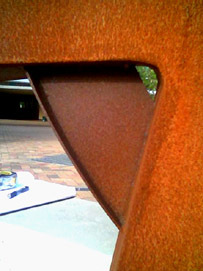 In the earlier images, the steel surface has yet to weather to its rich orange red patina. The fifth image shows this patina after one year of weathering. 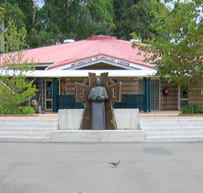 The sculpture has been well received and a second sculpture was commissioned and recently installed in another College.